Clamping of the portal vein during a recipient hepatectomy during the anhepatic phase causes venous stagnation and hemodynamic instability. To prevent this, a temporary portocaval shunt is placed at some centers. 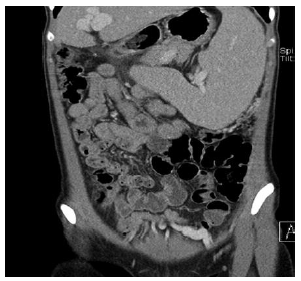 This case report shows the patent umbilical vein of a patient undergoing a recipient hepatectomy, leading to a 20% reduction of pressure in the portal vein. 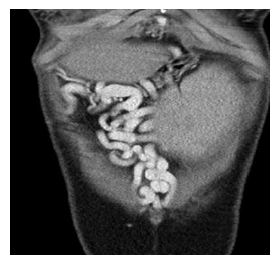 Preservation of a patent umbilical vein may help prevent complications of high portal vein pressure during a recipient hepatectomy. Portal hypertension is a significant factor complicating liver transplant surgery. Spontaneously developed portocaval shunts may help prevent these complications during a recipient’s hepatectomy. Clamping the portal vein during a recipient’s hepatectomy during the anhepatic phase causes venous stagnation and hemodynamic instability.1 To prevent this, a temporary portocaval shunt is placed at some centers.2,3 Although, we do not routinely perform portocaval shunting during a recipient’s hepatectomy, we preserved the patency of the umbilical vein during a recipient’s hepatectomy and demonstrated a 20% reduction in pressure in the portal vein. A 19-year-old woman with a history of multiple variceal bleeding and cryptogenic cirrhosis was admitted to our hospital for live-donor liver transplant. Her physical examination was remarkable for many collaterals on her abdominal wall and splenomegaly. The results of her laboratory analyses showed that she had pancytopenia (hemoglobin, 6.9 g/L; white blood cell count, 1.07 × 109/L; platelets, 17 × 109/L, increased international normalized ratio, 1.71; bilirubin, 331 μmol/L, and blood ammonia concentration, 55.5 μmol/L). The results of her other biochemical parameters were within normal limits. A computed tomographic examination of the abdomen revealed blunted liver margins, atrophy in right liver lobe, massive splenomegaly, and dilatation in the portal vein. A patent dilated umbilical vein was present. Numerous collaterals were present on the lower portion of rectus abdominis muscles and diaphragmatic surfaces (Figures 1 and 2). During the recipient hepatectomy, we protected the umbilical vein and the collaterals. After releasing the falciform ligament (Figure 3 venous catheter was placed in the mesenteric vein. This catheter measured pressure in the portal vein during the operation. After isolating the main portal vein and its right and left branches, we transected the bridge tissue over the umbilical portion of the left portal vein and the ligament of teres. We then taped the secondary branches of the left portal vein to segments II, III, IVA, and IVB separately, and ligated and cut these branches. Caudate branches from the left portal vein also were isolated and ligated. After ligating the right portal vein on the liver’s surface, the main portal vein was released completely from the surrounding structures. 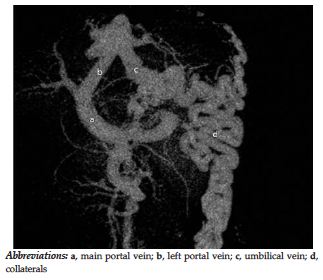 The left portal vein was continuous with the umbilical vein; these vessels were kept intact for the remainder of the operation, until the portal vein was ready for anastomosis (Figure 5). We measured portal vein pressure during surgery at different times (Table 1). Portal hypertension is a significant factor complicating liver transplant surgery. Patients with cirrhosis commonly have portosystemic shunts that develop during course of their illness. These shunts divert blood from the liver into the systemic circulation. During a recipient hepatectomy, these shunts may be beneficial in preventing splanchnic congestion.4 Some authors advocate routinely creating a temporary portocaval shunt during a recipient’s hepatectomy to preserve kidney function and decrease splanchnic congestion.3,4 González-Pinto and associates5 described a portoumbilical anastomosis as a means of portosystemic shunt during a liver transplant. These authors perform an anastomosis between the patent umbilical vein and the portal vein, demonstrating a flow of 1.2 to 1.7 L/minute in the shunt. Some patients show recanalization of the umbilical vein as their main spontaneous portosystemic shunt.5 During a recipient hepatectomy, a remnant of the umbilical vein (a round ligament of the liver) was ligated to reach the falciform ligament. In this case, the umbilical vein was patent and dilated; we therefore dissected this vein and its adjacent collaterals during the recipient hepatectomy to reduce the portal vein pressure during the anhepatic phase. This provided a 20% reduction in pressure in the portal vein. The patient did well after the operation and was discharged 13 days after surgery, with no renal impairment or hemodynamic instability during her follow-up. Preserving the umbilical vein (if patent) and the adjacent collaterals may reduce portal pressure during a recipient hepatectomy. Tzakis AG, Reyes J, Nour B, Marino IR, Todo S, Starzl TE. Temporary end to side portacaval shunt in orthotopic hepatic transplantation in humans. Surg Gynecol Obstet. 1993;176(2):180-182. Belghiti J, Ettorre GM, Durand F, et al. Feasibility and limits of caval-flow preservation during liver transplantation. Liver Transpl. 2001;7(11):983-987. Arzu GD, De Ruvo N, Montalti R, et al. 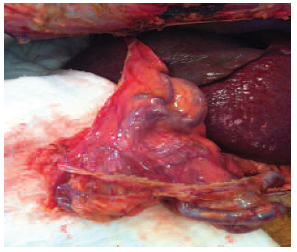 Temporary porto-caval shunt utility during orthotopic liver transplantation. Transplant Proc. 2008;40(6):1937-1940. Figueras J, Llado L, Ramos E, et al. 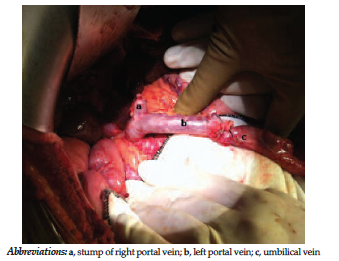 Temporary portocaval shunt during liver transplantation with vena cava preservation. Results of a prospective randomized study. Liver Transpl. 2001;7(10):904-911. González-Pinto IM, Miyar A, García-Bernardo C, et al. Portoumbilical anastomosis as a simple method of transient portosystemic shunt during liver transplantation. Transplant Proc. 2009;41(3):996-997.